Just wondering why everyone is billing Marc Levine as a “newcomer”.. He co-composed Tzaischem L’shalom which was featured on the album U’shmuel B’korei Shmo (2006) and on Nochi Krohn Band 2 released last year. Totally agree re Dor Acharon. It reminded me of Habet from MBD, S’ee Saviv from Avraham Fried as well as AF’s new song Yehalelu. I also think Maaleh Ani is a great song, but would prefer for there to be more lyrics… I’d put that together with B’sheim Hashem and Dawn of Moshiach for the top 3 of the album. Thanks for the update on Marc Levine – I was not aware of either of those songs, so I’ll have to look ’em up. I guess it’s all a matter of personal tastes, My favorite songs on the CD are 1) Yesh Tikvah 2) B’Sheim 3) Maaleh 4) Shalom Aleichem!! I got to say, but my taste is very different then yours! Bsheim is for sure my favorite! And I just can’t get enough of Sholom Aleichem! I do agree though that the intro is uncalled for. Maale is one of those songs where I hear Avraham Fried in. Yesh Tikvah is good and catchy, but he overdid the techno feeling to it. It is way too much. Also, he never really bursts out with a high part with this song, the way Avremel would for sure have done! Avremel would never miss a chance to do that – to just keep climbing with the song. Berachamim is another great song, where I love the way he gives it a high feeling when he goes to the English. And no, I feel the words are jut great! Dawn of Moshiach is another real great one. He bursts forward going high. He also has a random tune in middle (some rapping) – I believe Avremel is the one that really put that idea forward – if your song is 5 minutes long, put something random in middle. Take keep climbing, light, and virtually every song on the new album for that idea. When you know there is a good piece smack in middle, it makes it hard to want to skip to the next song after thirty seconds. What can I say? Benny really shocked me with this cd! My only critique is that there is too much electrical guitar. Very good review, I agree with most of your critiques and compliments, except for Shalom Aleichem which I thought was not that bad. 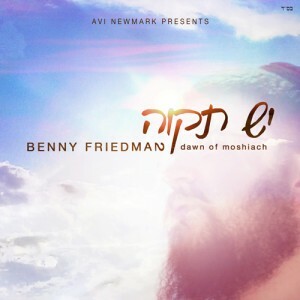 Not being a professional critic nor entertainer, I felt inspired by the entire album, appreciating Benny Friedman’s musical talent. He is not trying to sound like anyone else, so why the comparisons? Of course he has a different presentation and command of his lyrics, the varying instrumentals and their articulation than other artists. This is what sets him apart and why we appreciate his music so greatly. As for the electric guitar and techno of the album’s first track, I am well over fifty and I truly enjoyed this arrangement. It takes artistic courage and confidence to be creative in this manner. Benny, may Hashem continue to give you strength and blessings. Thank you for sharing your gifts with all of us!